I have a love-hate relationship with snow geese. Here in Northern California, we are blanketed in snows every winter. Blizzards of them descend on the rice fields north of Sacramento, their grinds a white tornado of birds. Their barking din echoes in my ears long after I’ve left the marshes. They are everywhere. So you would think that with a half-million wintering snow geese, plus another 200,000 Ross’ geese (the snow’s smaller cousin) it would be easy to shoot your fill here in the Central Valley. Nothing could be further from the truth. Snow geese are aloof. They travel the valley en masse, in flocks that can number in the hundreds. Ever try calling a group of 300 snow geese down to your decoy spread? Unless you are a very good caller — and you have 2000 decoys around you — it ain’t happenin’. Most days we mere mortals just stare longingly at the lords of the air as they cruise over us 150 yards up. We are cats peering through a window, licking our chops at the doves just outside. So close. So far. But sometimes the window opens. Strong winds force the geese to fly lower, where wind speeds are typically slower. In a really powerful wind, the white kings must return to earth. Where we are waiting for them. Saturday morning came early, 2:30 a.m. to be exact. I had drawn the No. 23 pick at the Sacramento National Wildlife Refuge, but our friend David had the No. 5 pick, which would practically give us free rein of choice places to hunt on the refuge. And it was windy, with gusts expected at 30 miles per hour or more. David had done his research, and chose a blind where we were likely to intercept snow geese taking flight into the wind, and out of nearby “closed zones,” where hunting is prohibited. “It’s going to be tough carrying back our 18 geese today,” David joked. I snorted. The idea of David, Holly and I each getting our limit of six snow geese was preposterous, even on a windy day. I tend to be a cup-half-empty guy in the field: I’ve seen the best-laid plans of mice and men fail time and time again, and so I’d rather be pleasantly surprised with modest success than crestfallen once high hopes crash. Just before dawn, the ducks were flying everywhere. Even my hopes began to rise. But of course, they were flying just out of range. We were required to hunt from a stomped-down, mud island blind with little cover. It was clear the ducks knew danger lurked on that island. David managed to drop a teal, but soon after the ducks disappeared. We would see very few of them for the rest of the day. But as expected, the snow geese were flying. Low. Holly shot one, but it sailed. This is one of the great frustrations of snow goose hunting. Geese in general are tough animals. I can’t count the number of times I’ve plucked a goose and found healed shotgun wounds on wings and bodies and legs. They don’t die easy. Holly dashed off to recover her goose. While she was gone, another group of geese came toward us, barking all the way. They flew right over the blind, and David and I rose up and dropped two. Thank God. I jumped out of the blind, grabbed the geese and brought them back before another flock flew by. 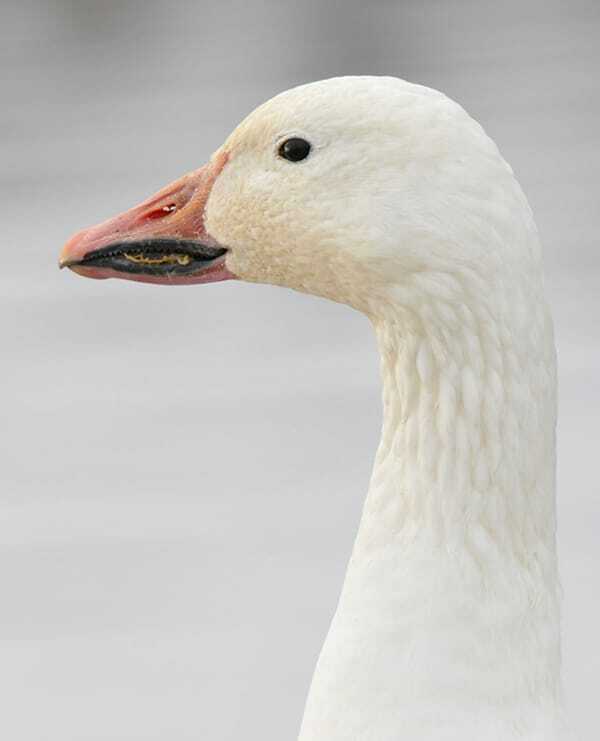 My goose was a Ross’ goose, a small species of snow goose that’s only slightly larger than a mallard. Holly returned, gooseless. Her snow had indeed died, but it landed in a deep canal in the closed zone, where hunters are forbidden to enter. Maddening. Equally maddening was the geese’s habit of coming right at us, closer… closer… and then side-slipping away to the left or right at the last minute. For every flock that flew right over us, ten side-slipped us. And even with the wind bringing the snows down from an unreachable 150 yards to a tantalizing 60 yards, 60 yards is an iffy shot at best. We needed them lower. As the day wore on, from time to time the goose flights would stop altogether. Once the drought lasted two hours. Why we stayed is beyond me. The eternal hope of a hunter, I suppose. Maybe the next flock would make a mistake. Maybe it’ll be lower. Maybe we’d actually kill one. Maybe. Perseverance paid off. Some geese did make mistakes, and I did manage to kill four snows on Sunday. But it took until sundown. We drove home, exhausted. Snow geese are primarily eaters of green things, not grain. Grass will keep you lean. Grain makes you fat. So snows are rarely pudgy. And their skin? It’s blue. Weird, I know. Looks unnerving plucked and roasted. But then again, I rarely bother with this anymore. Snow goose feathers are harder to pluck than any other waterfowl I know. So I skin most of them. Once skinned, however, snow geese are fine fare. 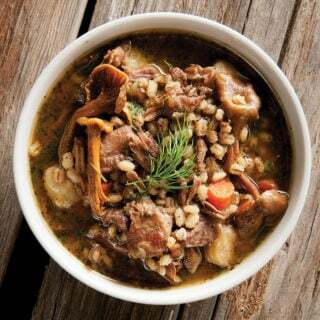 One great way to cook them is in this simple, Russian-inspired goose stew with barley, celery root and lots of mushrooms. It is a soul-satisfying, rib-sticking peasant dish. Just the thing to salve the frustration of 13 hours spent in the marsh, staring enviously at the lords of the air. 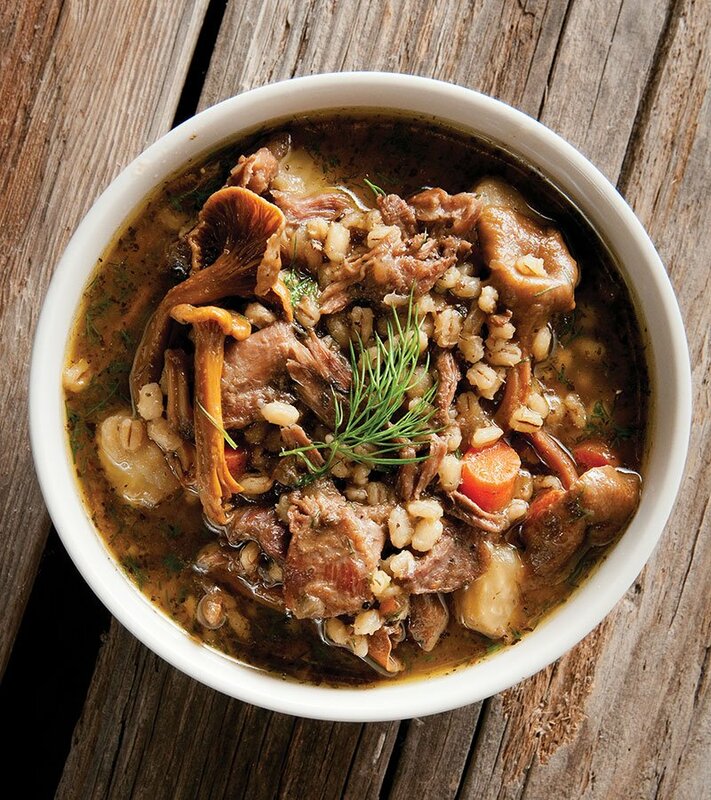 This is a hearty stew inspired by similar Russian stews I've come across over the years. I imagine it to be something eaten in Siberia, or on Wrangel Island, where many of California's snow geese spend their summers. I used snow geese in this recipe, but the dish would work with all sorts of meats. I also used wild yellowfoot mushrooms, which can be hard to find. Any fresh mushroom will do. Don't have celery root? Use potatoes. No barley? Rye or wheat berries would also work, although rye takes a long time to cook. No duck fat? Use lard or butter. No duck stock? Use beef stock. I made this yesterday. Awesome. The whole pot was eaten in one sitting. Is there a similar version of this that can be made with venison? Carol: Go ahead and use venison instead of goose legs. Should be fine! Used carcass and leftover meat from Xmas goose, added a few duck carcasses. Exceptional flavor. My father insists that we continue raising geese exclusively for the purposes of this recipe. I made this recipient for the first time three years ago and make batches of it every year with duck breasts, pheasant and sometimes chicken. LOVE it. So do the kids.